Tuesday's explosion at a building in Aliso Viejo killed one woman, believed to be the owner of a day spa. Accidental causes have been ruled out, the FBI says. LOS ANGELES — One person was arrested amid the investigation into an explosion at a commercial building that killed one woman and seriously injured two others, authorities in Southern California said Thursday. Stephen Beal, 59, of Long Beach was not charged in connection with Tuesday's incident, federal investigators said, but they found a destructive device while serving a search warrant at his Long Beach home. Beal was arrested on suspicion of being in possession of an unregistered destructive device and was expected to appear in federal court Thursday afternoon. Authorities said Wednesday that they don't believe the blast was an accident and was caused by a device of some kind. "We do not know the motive behind the case at this time," Orange County Undersheriff Don Barnes said at a news conference at the sheriff's department headquarters in Santa Ana. 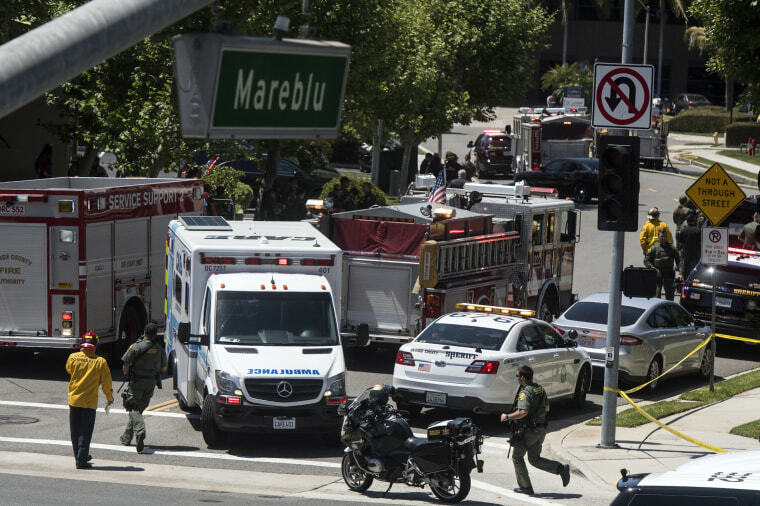 The explosion occurred at a suite in a commercial building in Aliso Viejo, south of Los Angeles, at around 1:10 p.m. PT (4:10 p.m. ET) Tuesday, he said. The two injured women are expected to survive, Barnes said. Another person was treated for smoke inhalation and released, he added. The explosion took place at a day spa in the building, Barnes said. Police have tentatively identified the dead woman as Ildiko Krajnyak of Trabuco Canyon, California, who is believed to be the owner of the day spa. Barnes initially said she was 40, but the sheriff's office later clarified that she was 48. The FBI and federal Bureau of Alcohol, Tobacco, Firearms and Explosives are assisting in the investigation. "At this point, our working theory is that this explosion was caused by a device, and although the damage was extensive there are some components that we have located at the scene of the explosion that are inconsistent with what one might expect to find at this business," said Paul Delacourt, the assistant FBI director in charge at the Los Angeles field office. The two women who suffered severe injuries in the explosion were near its origin, and are believed to have been patrons of the business, Barnes said. They were undergoing surgery Wednesday, he added. Delacourt said accidental causes of the incident, such as a gas main break, had been ruled out. Law enforcement sources familiar with the investigation had said Tuesday that it appeared that an explosive device was contained in some sort of package, but Delacourt said that has not been determined. "At this time we do not know how the device arrived at the location," Delacourt said. Asked if there were any concerns that there could be other targets, Barnes said: "We don't rule out anything, but at this point there’s nothing that would lead us to believe that there are." Delacourt said the damage at the scene was extensive, making it hard to identify some items. Material is being sent to the FBI crime lab in Quantico, Virginia, for analysis.